All aboard the Polar Express! Do you have your ticket? 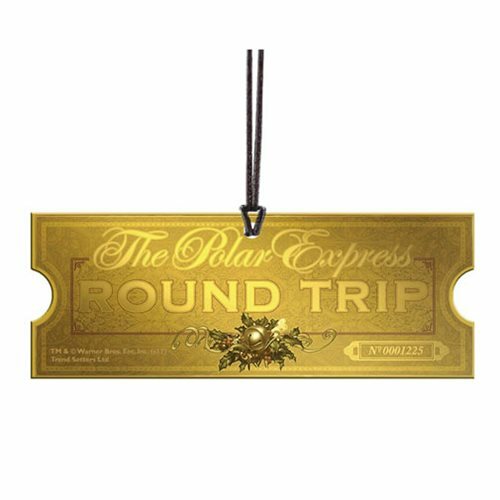 With this Polar Express Ticket Hanging Acrylic Print, your golden ticket is always ready for use. All you have to do is believe. Shaped like a whimsical train ticket, this 4-inch wide x 1 1/2-inch tall print is sturdy and scratch-resistant, and it catches natural light to illuminate the golden design. It looks festive on any tree and makes an appreciated gift for any lover of the book or movie. It's also just dandy for a little one who's about to take their first magical trip aboard the Polar Express! Hanging string included.